Since June 2018 the Rollz Flex is also available in a smaller version: the Rollz Flex Small. The design of this rollator is adapted for people with a body length of 4 ft 7⅛”to 5 ft 2¾” / 1.40-1.60 m.
Like the standard version, it is agile and stable, lightweight and compact. The frame is smaller and has different ratios than the standard Rollz Flex. 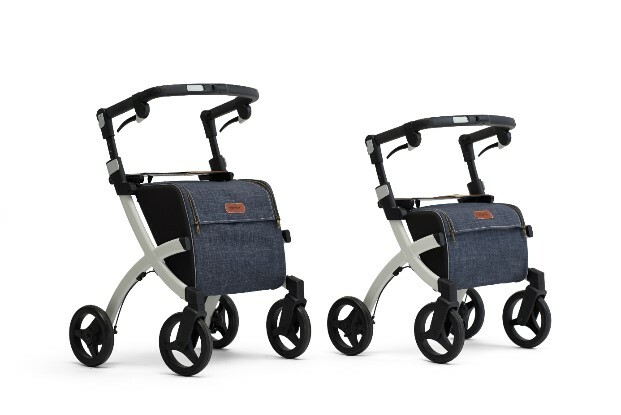 The handlebar of this cute small rollator version is adjustable in five height positions instead of nine. The lowest position is about four inches or ten centimeters lower than the standard Rollz Flex. The bag is adjusted to the smaller size of the frame, it fits fourteen liters. The small version has classic brakes. The version with the waterproof bright purple bag is combined with a black seat, the denim grey edition comes with a cognac seat. By adding this small version to the product range, Rollz offers a wide range of design rollators for both shorter and taller people with a length of 4 ft 7⅛” to 6 ft 3″ (1.40 m to 1.95 m). Our design team has completely redesigned the Rollz Flex for people who are not so tall as a lot of people in the Netherlands are. Designer Martijn Schaaper: ‘The frame is optimally adapted to their ergonomic dimensions; the handlebar has been shortened in height and depth as well. The wheelbase has remained the same. In this way it is easy manoeuvrable, thanks to the small turning circle. The first sentence reads: お し ゃ れ な デ ザ イ ン で お 出 か け し た く な る 気 持 ち を 後 押 し, which translates to: ‘Gives you the feeling that you want to go out with a stylish design’. The version shown has a cognac seat in combination with a bright purple bag, this is only available in Japan – the color combination does remind of blooming cherry trees. Also the Rollz Motion² is available in a smaller model for some time now. The frame of this small version is two inches / five centimeters lower. This combined walker and wheelchair is suitable for users of approximately 4 ft 11″ to 6 ft ⅞” / 1.50 to 1.85 m. The Rollz Motion Small is available in two colors: island blue and matt black.